​Roger’s career as a balance/audio engineer, music producer, film mixer, business creator and mentor spans six decades (the 1960s – the present). In his role as a balance engineer at renowned Olympic Studios in London, he worked with artists such as Dusty Springfield, and was the first to record the Rolling Stones, a single ‘Come On’ which made the UK top twenty in 1963. In 1964 he emigrated to Australia taking a sound engineering/producing role at Armstrong’s Studios, and it was there he engineered/produced a significant number of Australia’s greatest acts of the day, including the Easybeats, Twilights and Master Apprentices to name a few. 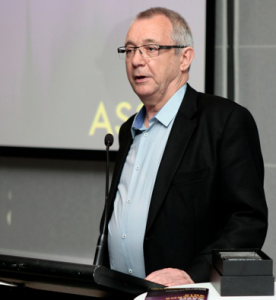 In the 1970s Roger moved into film mixing, eventually establishing Soundfirm, a world class motion picture sound mixing facility in Melbourne, to be followed in later years by simila facilities in Sydney and Beijing. Always at the leading edge, Soundfirm was the first Dolby ATMOS accredited facility to be established in Australia. As a sound mixer for film, he has engineered many and varied film projects including Mad Max and Star Wars, winning or being nominated for a number of awards including an Oscar (Moulin Rouge). Roger has always had an interest in technology and the tools deployed in creating audio masterpieces, encouraging & even owning (Smart AV) local manufacturers. However, for those who have encountered and worked with Roger, it is his generosity in mentoring that has advanced many a career, and in this regard, you will only ever hear respect and acclamation accorded to one of Australia's greatest sound engineers.